We are pleased to invite you to the Mega Education Fair on 25th Jan 2019. The event is scheduled to take place in Delhi at The Park Hotel, Connaught Place and it will be focused on overseas education. We would be glad if you participate and gain the utmost benefit out of it. We are associate company of M/s Pustak Mahal, a prominent publisher of India. Our publication “Rapidex English Speaking Course” has been an ‘All-time Bestseller‘ throughout India, and is published in 14 Indian and 3 foreign languages. 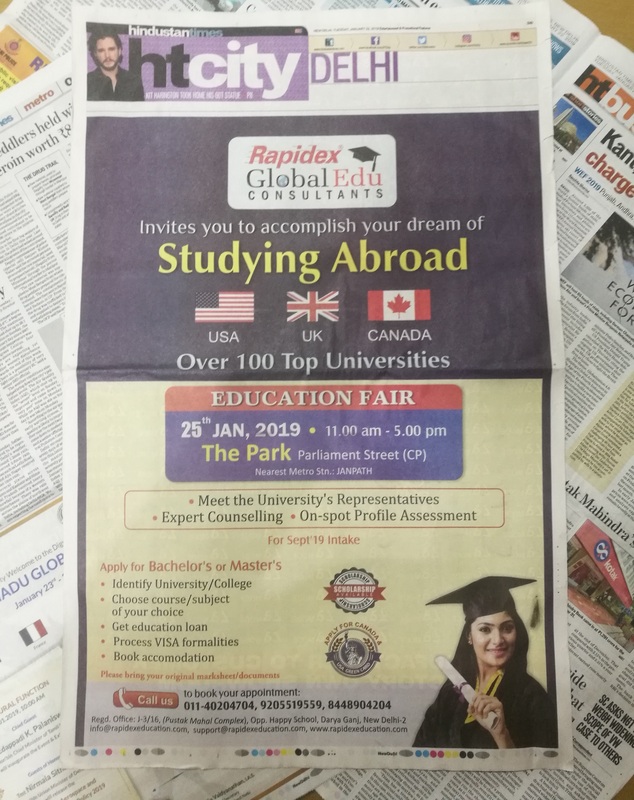 In Rapidex Global we provide counselling, and professionals ensure the applicant get all the required help from selecting a university, selection of course, admission, education loan, travel and accommodation. We also help students with scholarship, internship and placement through our network partners. We are representing over 100 best universities, spread over in U.S., U.K., Canada, Singapore, including some European Countries such as Germany, Spain, France, Switzerland. Copyright © 2016 Rapidex Global Education LLP. All Rights Reserved.